I have written quite a bit about dating sims in which you hook up with buff dads: the post-apocalyptic one, or the one where you can also date a manly goldfish. Well, I have one more for you, and it’s about dating gay Orcs. Yeah, Orcs. And Orcs, in the world of Tusks, are super-gay. They have a pride festival called the Ua (pronounced waaaa, a not-so-subtle nod to the Orks of Warhammer), they sometimes have multiple husbands, many wear snug banana hammocks and generally come decked out in classically queer attire. But that’s also not all they are. They have stories and they have religions and they have complex inner lives. It’s tough, after all, for an orc to make a go of it anywhere. Tusks, a pay-what-you-want dating sim for computer formats, looks to delve into some serious stories, with a curious premise. Some dating sims set themselves apart with a gimmick (like Hatoful Boyfriend, in which you date pigeons) and some with their writing or art. But Tusks does it all—really. It’s not out yet, but there’s a lengthy demo that runs across several in-game days of play, and 60,000 words of dialogue. That’s almost as long as the first Harry Potter novel. And the possibilities here are certainly complex and nuanced, at least to start. The game opens by asking whether you’re cool with adult content. Well, duh, dating sim, it’s what we’re all here for. But then it asks a more intriguing question, one you might want to spend some time thinking about: Whether you’d like the NPCs of your game to have their own autonomy. Picking “yes” means that characters will respond to your advances in unpredictable ways, with no gaming the system. No one set of answers will guarantee you romantic or sexual success—y’know, almost as if you were dating one of them troublesome humans. Wanting a more “realistic” run, I went with the autonomous queer orcs. I was excited, at first. The orcs are diverse and complex. They’ve got histories rife to explore. There’s Ferdag, the rugged warrior with plenty of wins and scars to prove his value. Ror and his pair of husbands lead the group, guiding us on the way to Orkney, the home of his ancestors. The pilgrimage is a return to normalcy after the wild pride festival of Ua. And given that orcs are nomads by nature, the journey marks new beginnings, new friendships and possibly new relationships. The opening is meant to mirror an experience that developer Mitch Alexander had when he was playing Skyrim. 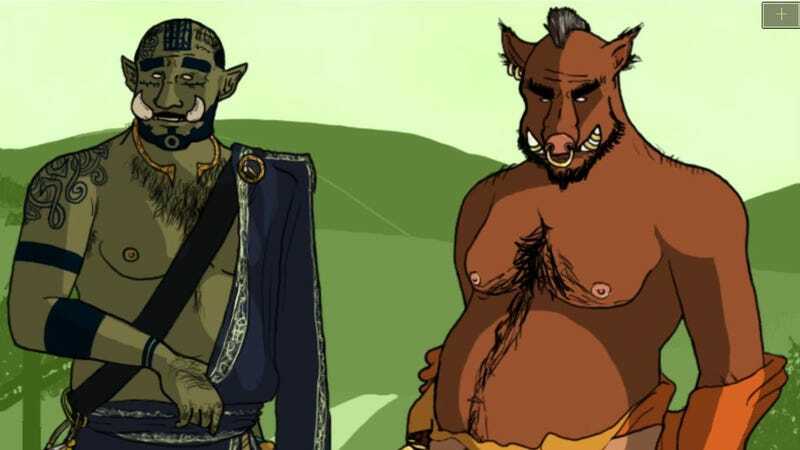 Playing as an orc, at one point he was pulling a group of orcs together to create a new “found family.” The notion is common throughout all kinds of cultures, but is especially important in real-world queer circles. Often, families of LGBTQ folks may disown them when they come out. Tusks flips that and countless other tropes—not necessarily, I think, to deconstruct or comment on them (though that does happen too), but to help establish a new, positive environment to explore these ideas. When it’s time to head out, one of Ror’s husbands, Malgom, suggested that we call ourselves the Tusken Raiders. Ror and I thought that was too aggressive and violent, though. I suggested “The Green Troubadours,” to settle into a role I’d picked out before settling in to play—a migrant storyteller, looking to start his family. Tusks gives players an enormous amount of latitude to craft who they want to be, particularly as visual novels go. This wasn’t just a role I was given, nor one I came up with for my own headcanon—your motivations are yours, and with NPC autonomy enabled, you can never be sure how everyone else will react. It conveyed peaceful intentions, too. The Green is a sacred place, the hallowed ground where Ua was held each year. Our name suggested that we were proud of our heritage, but would rather swap tales and connect and celebrate than fight or hurt others. We may be a rough hewn band of burly green men, but we’re a different sort. Orcs, like the queer community broadly, are outcasts. Like a “questioning” guy showing up to a gay bar, Aed is a mystery. His interest could be earnest, but a lifetime of harassment and mistreatment have the group on-edge when they talk to him. His role is one of genuine curiosity, and his arc (at least the portion that’s playable, currently) definitely follows a pattern that those experienced in the kink or queer communities will immediately recognize: the over-excited newbie. That trait blends with racial undertones to create a genuinely complex guy. “I figure all of the main characters are different aspects of my identity,” Alexander tells Kotaku. Right now, only the first two days of the total fourteen are fully playable.. That doesn’t sound like much, but there’s a lot going on underneath that. There’s been a lot of effort and care placed into how everyone’s presented, and a conscious effort to work with the “otherness” of orcs in a complex, respectable way, instead of using them as a shorthand for “people of color” as so many fantasy universes have in the past. But, more than that, Tusks shows an exceptional level of detail that really works as the foundation for a story like this. There’s already shared universe fiction, and plenty of background material, as well as the already substantial amount of in-game writing. There’s still a lot to finish, but the groundwork is here not just for a queer dating simulator, but a heartfelt, inspired epic about the messiness of life. Plus, who hasn’t wanted to date an orc? They’re gruff, rugged, often with cute tufts of hair all over and delightfully aggressive fangs… oh boy! Right? Right?! Or am I just weird?